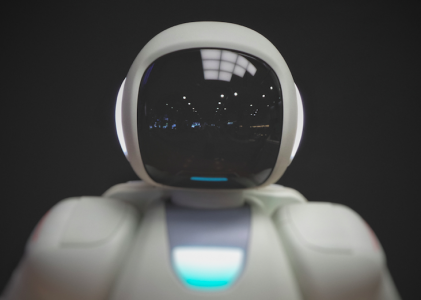 Recently our friend and advisor Avinash Kaushik wrote a blog post in which he used ClickEquations Analyst to showcase a number of advanced analyses for paid search. Each of these used a report or dashboard which is provided to all ClickEquations customers. In this and the next few posts we’ll dig a little deeper into these reports, sharing some background about how they were created, how they can be customized and used, and how they can help you to improve your paid search campaigns using ClickEquations. The first report Avinash covered is a new one, set to be released in a mid-July update. It’s called the Keywords by Engine report. 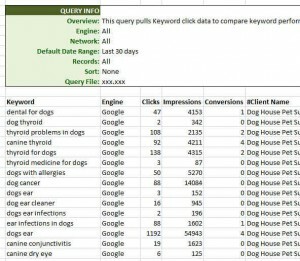 This report uses a single CQ Analyst query to pull all keywords with at least 1 click over the past month, along with the number of conversions for that keyword. This information is then pulled into a an Excel pivot table, which allows us to see how the keywords compare across engines based on either clicks or conversions. To sort the data, you simply point to a cell in the Google, Yahoo, or MSN columns and right click. Then choose Sort > Sort Largest To Smallest. The keywords are then sorted based on the number clicks in that engine, and the other engine columns show how many clicks each keyword got in those respective engines. As Avinash pointed out, this provides a view of pure opportunity. Running this report for client after client has shown vast differences in how keywords perform between the search engines. While there are many differences between the engines, and some valid reasons why one keyword or another would perform differently in these different environments, it seems clear that all of your top 10 or 20 performing keywords in Google shouldn’t be non-performers in Yahoo and MSN. Yet that is frequently exactly what is happening. Very often it’s simple oversights that will be highlighted. Such as versions of brand terms, mis-spellings, or even domain name addresses that turn out to have been left out of one engine or another. This report offers a great way of prioritizing the additions of new keywords to Yahoo and MSN accounts which you wish to expand. The first step would be to verify that the keywords producing great Google results (in terms of either clicks or conversions) aren’t already in those engines. If they are there then you’ll want to try and understand why their performance is so (relatively) low. 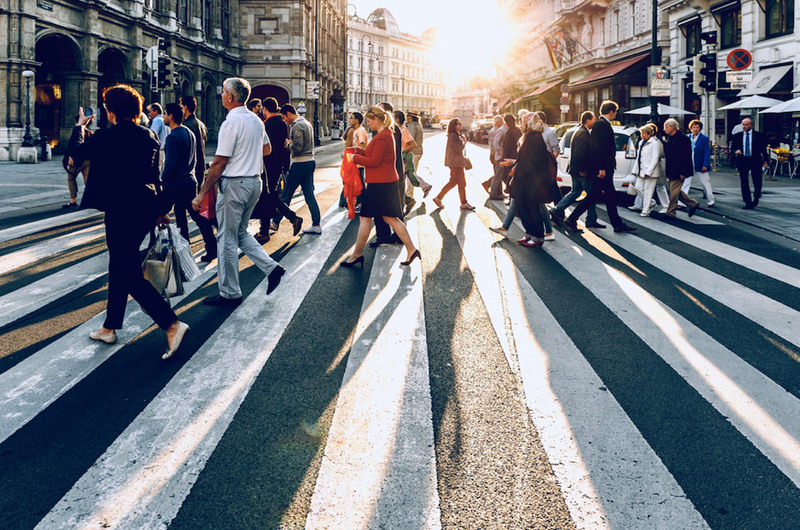 Differences in matching algorithms and search queries could explain it, so review the search query report for the ad group in the ClickEquations web application. Perhaps there are other keywords in the same ad group which are capturing those clicks or conversions in that engine. Or it could simply be a matter of the keyword needing better ad copy, or perhaps it’s position is poor and a bid adjustment is needed. 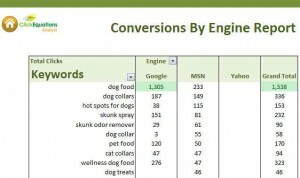 If the keywords are missing, taking the time to ad them in each engine could be an effort with a great return. The default query in this report gets keyword performance data for 30 days. 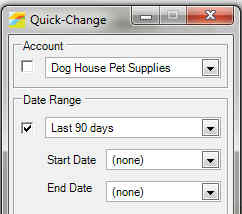 Using the Quick Change palette you could pull data for a longer time period – perhaps 3 or even 6 months – to see if the result patterns change. And while we’ve pre-built these keyword comparisons for both the clicks and conversion metrics, you could easily modify or extend the report to compare impressions, CTR, or even ROI. That’s the great thing about ClickEquations analyst – you have the full authoring tools to modify any of the predefined reports.